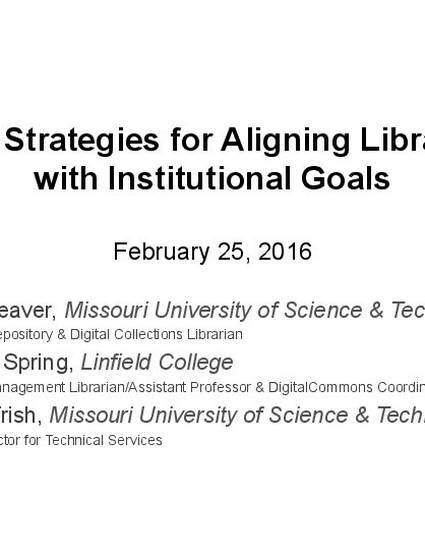 Aligning the library’s activities with larger institutional goals is key for library deans and directors. For many, integrating with larger campus priorities is a necessary step to strengthen the relevance of the library. Repository initiatives can play an important role here, at both large and small institutions. But how? The libraries at Missouri University of Science and Technology and at Linfield College have provided support for many of the top-level strategic initiatives through innovative repository services, including student recruitment and retention, community engagement, and research and data support. In this presentation, Roger Weaver, Kathleen Spring, and Maggie Trish discuss how they have sought out faculty and administrative needs and strategically adapted their repository programs to meet them. From a university-wide survey to assess faculty’s digital needs to a top-down alignment with the institution’s strategic goals, these efforts have borne out repository initiatives that, far from struggling to find content, are inundated with requests for support with projects from all corners of campus. In addition to discussing specific needs and projects, the presenters provide tips and advice for how repository managers and librarians in general can connect institutional repository initiatives to strategic institutional priorities. This invited presentation was given as part of the Digital Commons Community Webinar series, sponsored by bepress.